Students get ready to go fishing during the day at Dyar Pasture. Photo by U.S. Forest Service. In 2010, the Obama Administration launched the America’s Great Outdoors Initiative to conserve public lands and promote outdoor recreation. It also encourages community-based recreation programs to engage people where they live, learn, and play. Along similar lines, the U.S. Forest Service has a Kids in the Woods program to support youth nature programs. 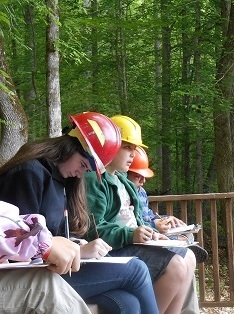 Recently the Forest Service’s Southern Research Station (SRS), Oconee Ranger District and the Georgia Department of Natural Resources (GA-DNR) partnered to host students at Dyar Pasture; a recreational area on the Chattahoochee-Oconee National Forest. Students from the nearby Union Point STEAM (STEM plus the arts) Academy and Elementary School, the first rural K-8 STEAM School in Georgia, participated in the field trip. Students rotated to different stations where they watched birds, examined water quality, fished, and sketched nature scenes during an outdoor art activity. District wildlife biologist Elizabeth Caldwell helped organize the trip and spoke to students on the history of Dyar Pasture along with the effects of grazing cattle on the local ecosystem. 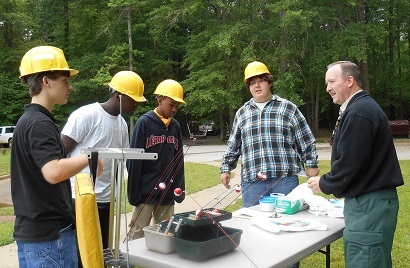 SRS technology transfer specialist Eric Kuehler discussed the importance of water quality and showed students how to identify macroinvertabrates in a site water sample, while SRS forestry technician Chris Crowe helped students explore a popular outdoor activity – fishing! He also explained how invasive fish affect the ecosystem. GA-DNR’s Linda May took the students bird watching and showed them how to measure wingspan to compare different species of migratory birds. For example, the aspect ratio is the fraction of a bird’s wing length to its width. According to the GA-DNR, one wing of the wandering albatross is 72 inches and has a width of 10.5 inches, allowing it to make its long trip across the Gulf coast. Other students experiment with sketching outdoors. Photo by U.S. Forest Service. “Students were relieved to get outdoors and decompress after intense exams. They enjoyed another great field trip with the Forest Service,” shared Viniece Jennings, research scientist with the SRS Integrating Human and Natural Systems unit in Athens, Georgia, who coordinated the trip and presented at the art station.